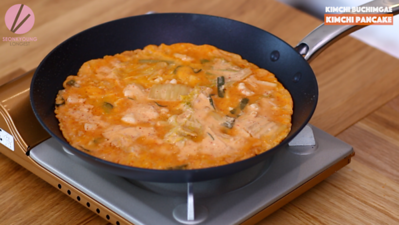 My mom called me the other day and asked me if I tried kimchi pancake with shrimp and pork. I said no, and she said I must. 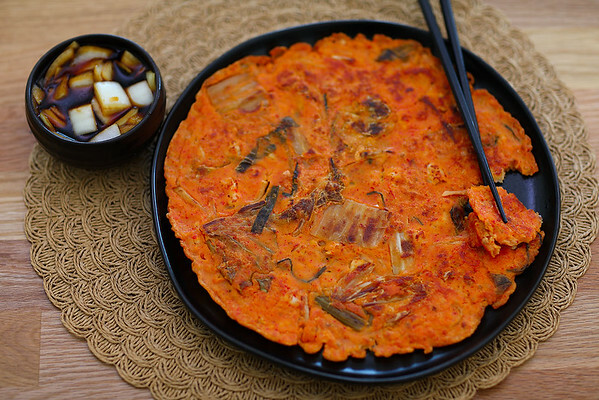 So I did and it was the BEST kimchi pancake EVER!!! 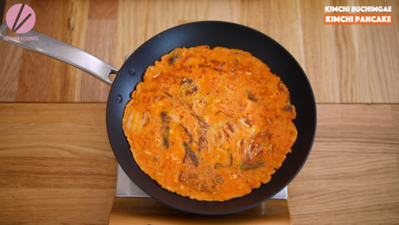 Kimchi pancake is savory pancake with kimchi and choice of protein. 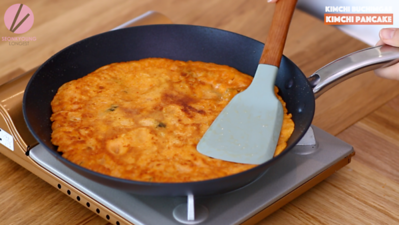 You can make it without protein, so you can keep this recipe vegetarian if you want! Chop shrimp not too big, not too small, just chunky enough. 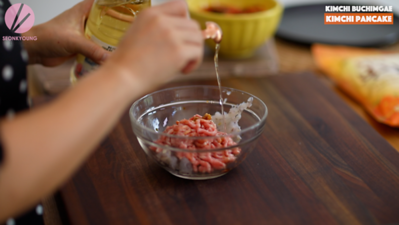 Mix chopped shrimp, pork, garlic, soy sauce, mirin and black pepper in a mixing bowl. Set aside. 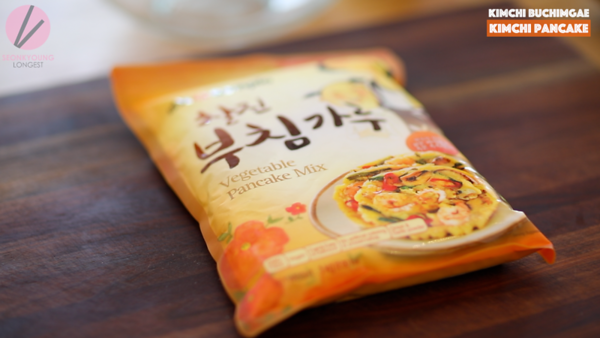 For this recipe, you could use this Korean vegetable pancake mix, you can find them at local Korean grocery stores. 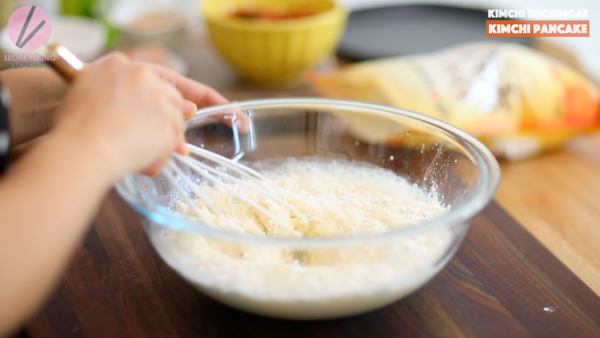 But don’t worry if you can’t, you can use tempura flour from your local grocery store or make it from scratch! 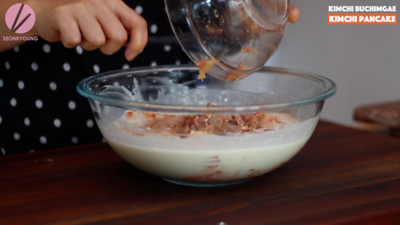 To make it from scratch, please check out the written recipe at the end of this post! 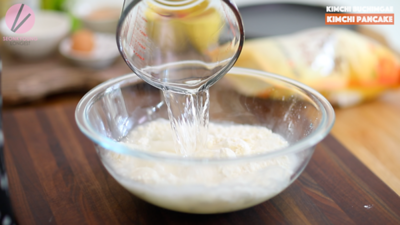 Mix pancake flour, water and egg and whisk until well combined. Add kimchi and pork & shrimp mixture. Mix well with a spoon. 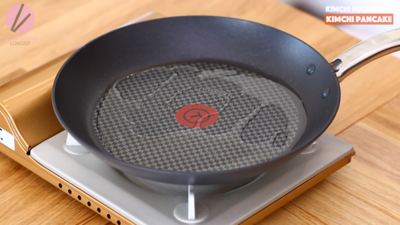 Heat a large skillet over medium heat; add enough cooking oil to cover the skillet. 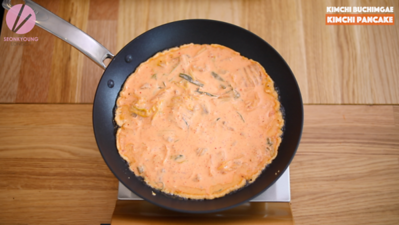 Pour about a cup of batter and spread evenly around the pan. Cook 3 minutes or until the bottom of the pancake is golden brown and top of the pancake is settle. 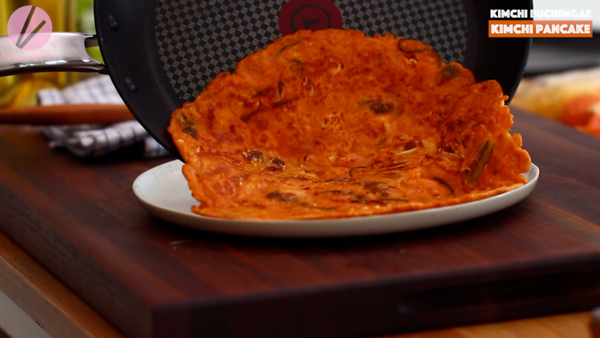 Flip it over and cook another 3 minutes or until the pancake is fully cooked. Repeat with remaining batter. Serve with onion pickles or some cubed 1/4 of small onion in equal amount of soy sauce, vinegar and pinch of sugar for dipping sauce. Mix shrimp, pork, garlic, soy sauce, mirin and black pepper in a mixing bowl. Set aside. 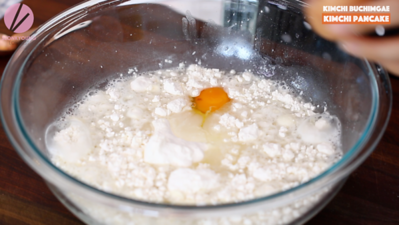 Mix pancake flour, water and egg and whisk until well combined. Add kimchi and pork & shrimp mixture. Mix well with a spoon. 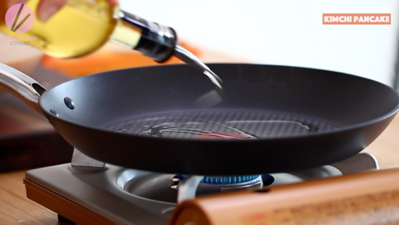 Heat a large skillet over medium heat; add enough cooking oil to cover the skillet. 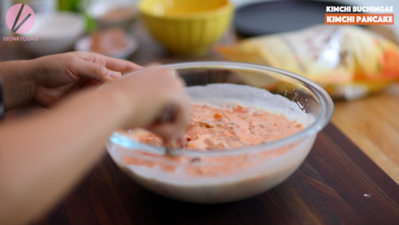 Pour about a cup of batter and spread evenly around the pan. Cook 3 minutes or until the bottom of the pancake is golden brown and top of the pancake is settle. Then flip it over and cook another 3 minutes or until the pancake is fully cooked. Repeat with remaining batter. 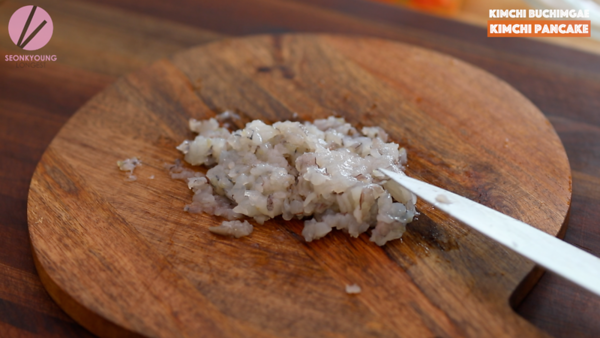 Serve with onion pickles or some cubed ¼ of small onion in equal amount of soy sauce, vinegar and pinch of sugar for dipping sauce. Enjoy! What a great dish! I am making this tomorrow morning. 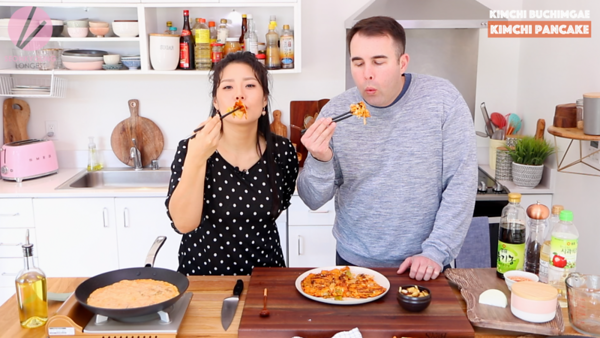 I’ve never seen kimchi used this way! So genius. Cannot wait to make this next time I head to the grocery store. Thank you for sharing!